Wash Tank Capacity 21 gal. What does it mean if an item or voltage is labeled "for international use" or "for Canadian use"? An item that has been labeled for international use has been designed to accommodate a foreign electrical standard that differs from electrical standards in the United States. These differences make International Use items incompatible with US electrical standards. An item labeled "for Canadian use" might have a different cord and plug, amperage requirement, or agency certifications than its comparable US-spec model. Contact Customer Solutions prior to placing your order if you have questions about the suitability of this piece of equipment for your application. Perfect for any high volume commercial operation, this Noble Warewashing 66 high temperature conveyor dish machine works to clean hundreds of dishes more efficiently than ever. Using just 0.68 gallons of water per rack, the unit can clean up to 225 racks per hour. A 25'' standard clearance is designed to accommodate larger wares, such as sheet pans, mixing bowls, and more. Integrated EnergyGuard electromechanical controls make for a user-friendly experience, while the Adjust-A-Peak adjustable conveyor speeds allows the machine to extend wash time and rinse contact for heavy soil conditions. The machine is fully automatic, and includes auto-fill. A self-draining wash pump allows for worry-free operation, in addition to a front dress panel and built-in splash shields which serve to protect from potential hot water burns. The entire unit boasts stainless steel construction for extended durability. 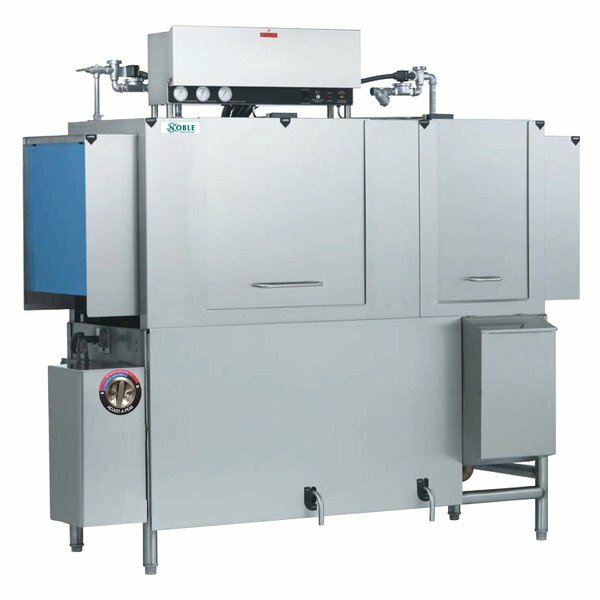 Adjustable bullet feet and legs keep the unit directly off the ground, and an exhaust vent fan control keeps external temperatures at an appropriate level. Inside, a 18kW wash tank heater will maintain proper water temperature. It requires a 230V, 3 phase electrical connection. This item meets the electrical product safety standards imposed by the ETL, a division of the Intertek Group, for use in the United States and Canada. This unit comes with a 1/2" water connection.